The next day we fly to Sandakan on the north east coast of Borneo. Centuries ago this was home to a cast of colorful characters : German Traders, pearl divers, gun runners, Scottish adventurers and Chinese seeking edible birds nest, but refusing to stand in line. Later the British, shocked to learn that there was an island with wonderful natural resources that they didn’t already own, arrived and promptly colonised the neighborhood, so adding one more piece of pink to the world map. 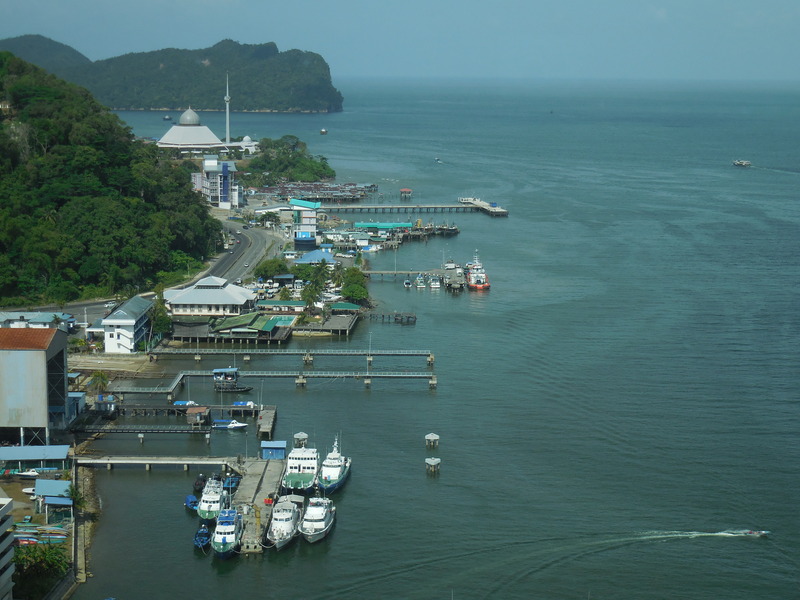 In 1883 they pronounced the tiny town of Sandakan the Capital of the State of Sabah . 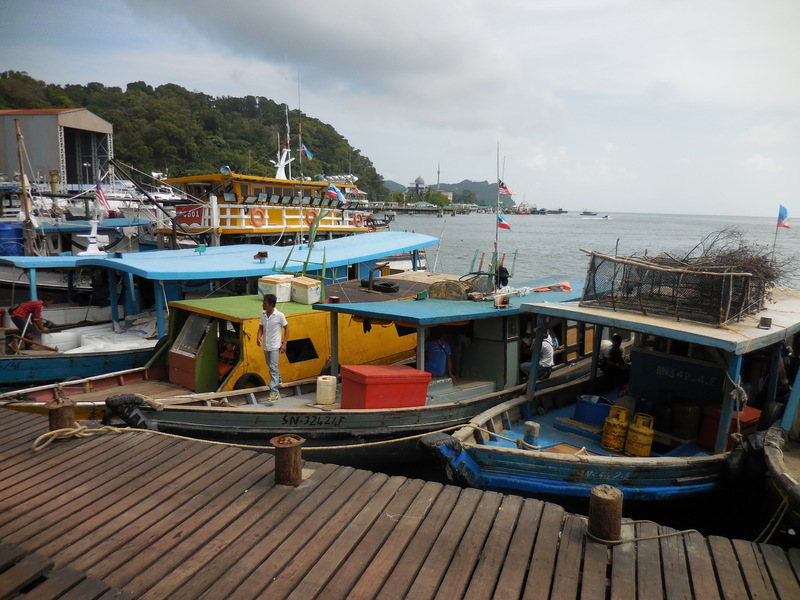 Its beautiful natural harbor made it a perfect place for trading and it quickly became a cosmopolitan city making a fortune from logging the rainforest, thereby destroying the land, many of the animals that lived in it and the natural beauty of the area. 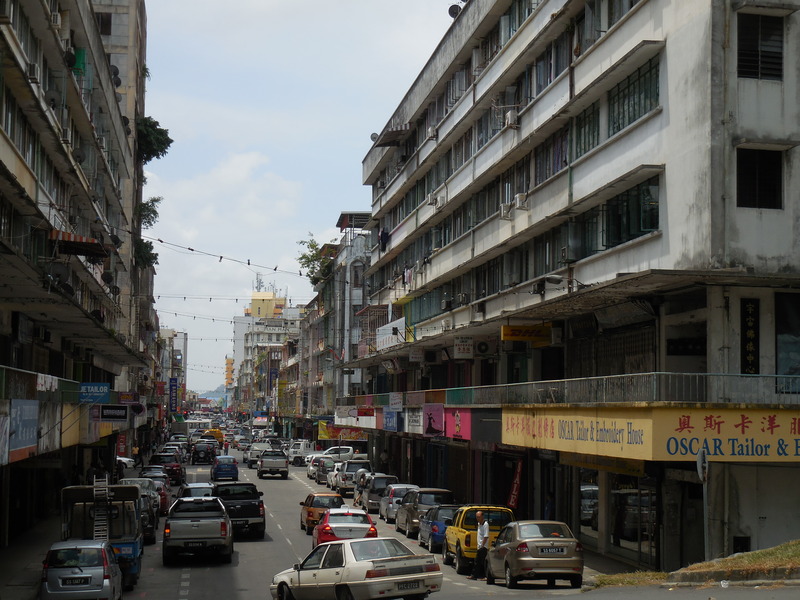 But the British thrived, and at one time Sandakan boasted more millionaires per capita than anywhere else in the world. But it is a very different world outside the hotel. and some immediately being packed on ice to be sent further afield. 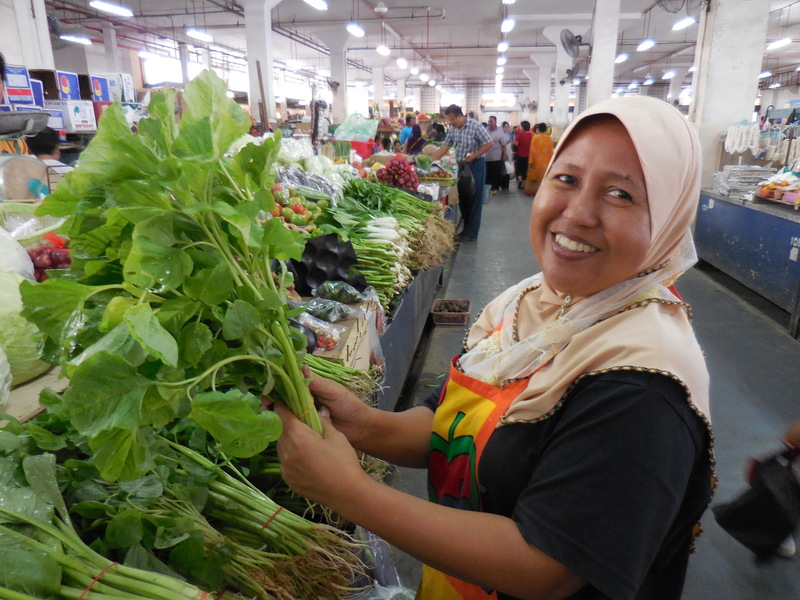 The market is a hive of activity, with vendors shouting for customers and calling out their prices. 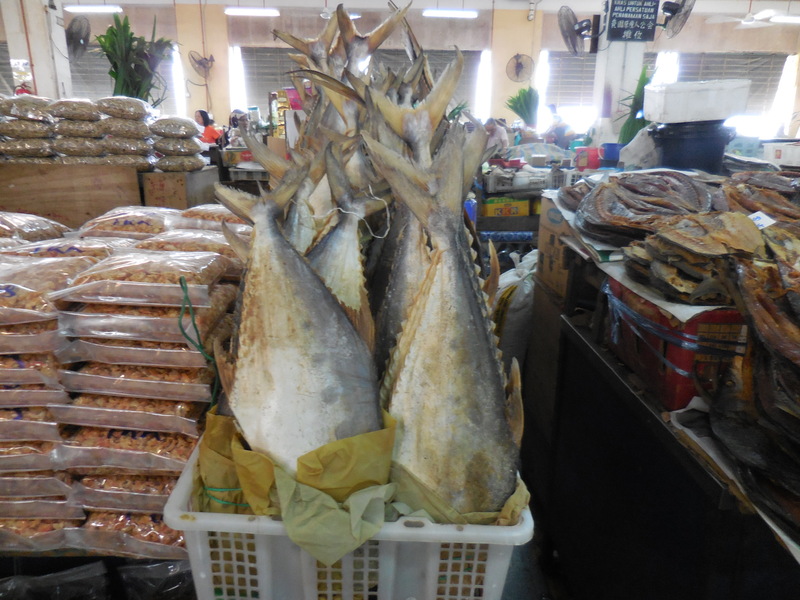 Sandakan sees very few tourists and the fishermen and fish merchants all seem happy to have someone interested in their lives. 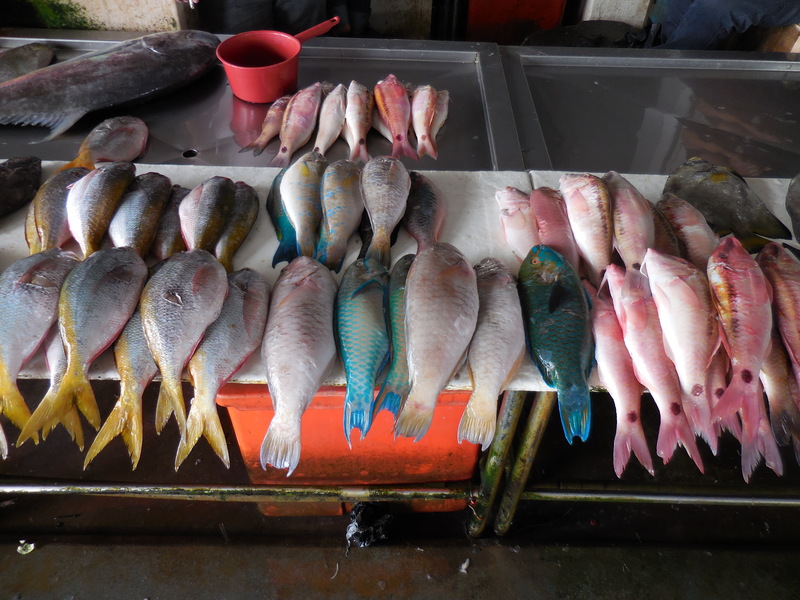 They cheerfully take time to show us the different types of fish, although their lack of English results in almost every type of fish being described as red snapper. 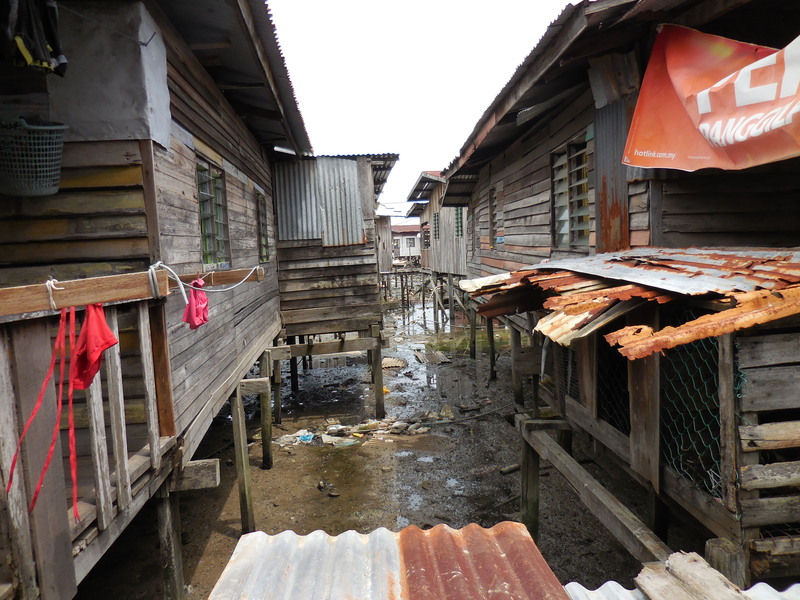 But as sad as this housing is, it does nothing to prepare us for the water villages. 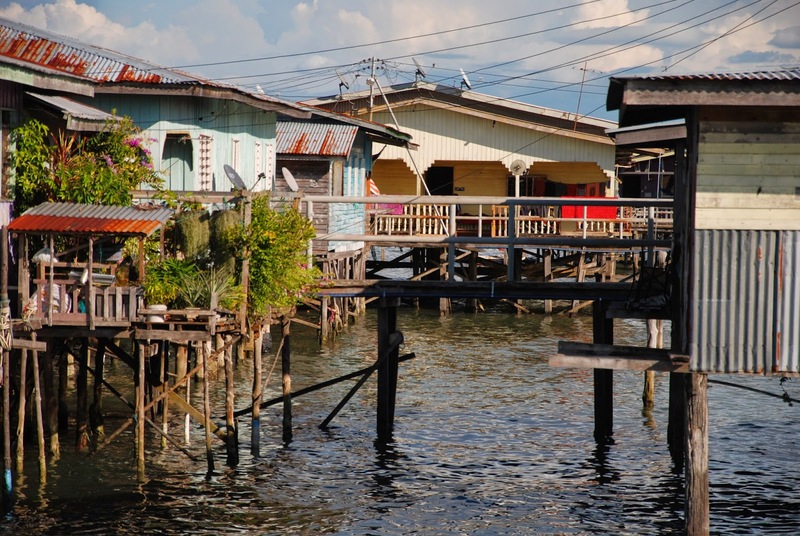 We have read about the stilt villages built out into the bay and thought they sounded interesting. If, as a tourist, you ask about them you are automatically directed to the one nearest town, called station 8 which sounds like something out of a scifi movie. It has clearly been smartened up with houses made of wood and corrugated metal that almost look charming and wooden or concrete walkways. Ask a taxi or one of the tiny local tour companies to take you to a water village, this is what you will see. But rent a car and drive yourself a little further afield and the story is very different. 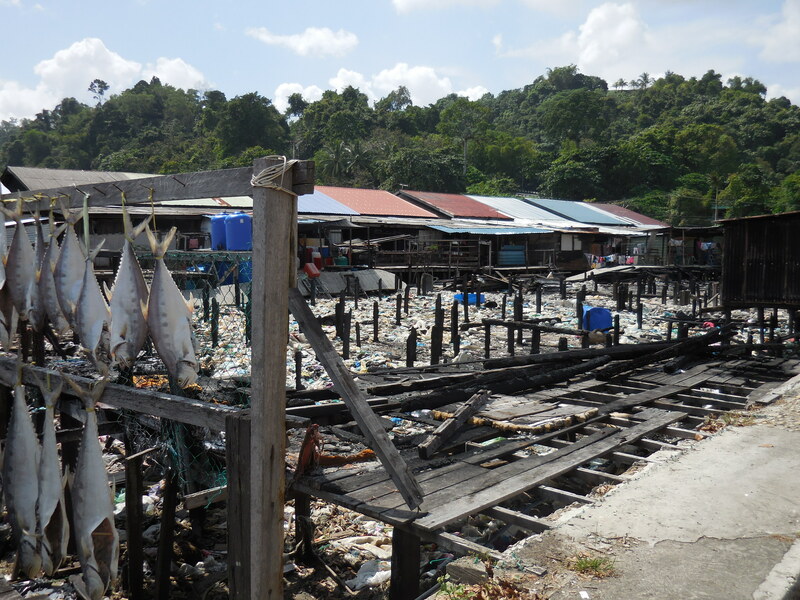 Borneo like so much of the world right now has a terrible problem with illegal immigrants. This north east area of Borneo is very close to the Philippines and on a clear day you can see the nearest Philippine Islands from Sandakan. There are estimates that anywhere from 25 to 50% of the population of this area is made up of illegal Philippinos. They come looking for work on the palm oil plantations. Some find it, but many end up in the water villages living off the few fish they are able to catch. 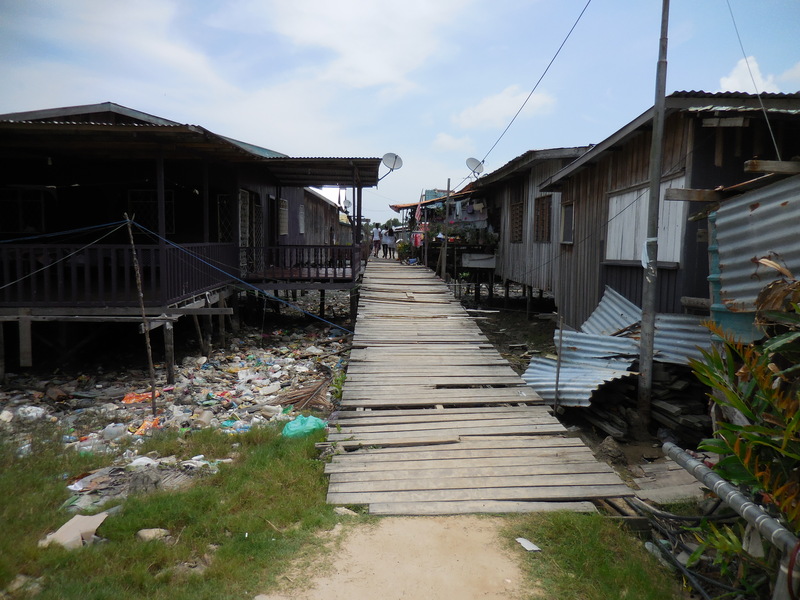 The stilt houses in these water villages are far more rudimentary, made from any scraps of wood that can be found. There is little pride of ownership and absolutely no reason for it. 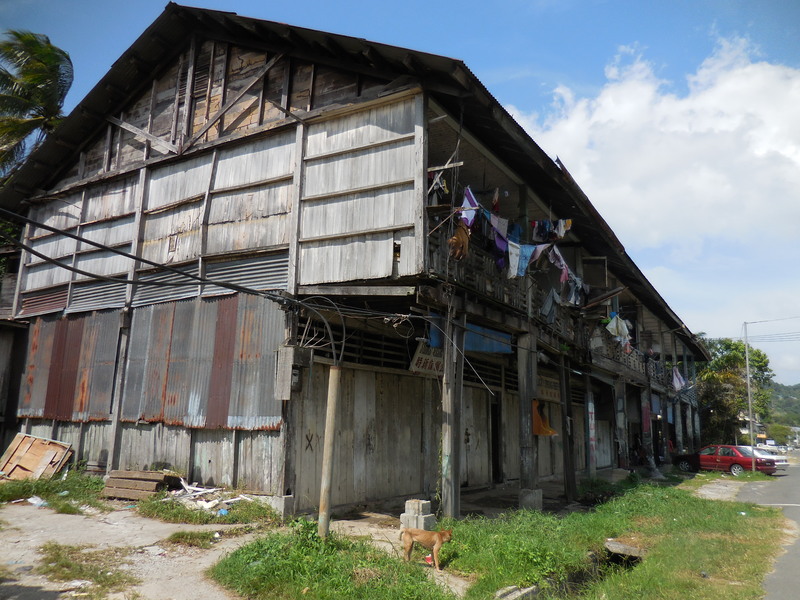 Here the houses are connected by rickety wooden gangways. The gangways are made from assorted planks clearly scrounged from elsewhere. Some of the planks are missing, some broken and some so thin that you daren’t step on them. Most of the houses have electricity but few of them have any waste disposal or garbage collection. Human waste drops directly into the water below the house, and the garbage just gets thrown into the water. Gordon refuses to leave the car, but I nervously explore some of the wooden gangways. The gangways are extremely rickety and many of the planks buckle and move under my weight, and then there are the large gaps with no planks that have to be negotiated. One misstep and I will fall into the filth below. It is not a pleasant thought. I think of Gordon sitting safely in the car, not knowing what has become of me. I try not to think about it as I carefully ease my way along between the houses. Unbelievably most of the houses have TV’s . Despite it being the middle of the day, they are switched on with the entire family slouched in front of it, the great pacifier for all ages. I venture across and enter the Salon. It is spotlessly clean with quite amazingly, a white tile floor. Even more amazing is a short shelf lined with a small collection of Vidal Sassoon hair products. Standing in the middle of it all is a very effeminate man in his thirties with a flashing smile that reveals sparklingly white and even teeth. His hair is scraped together upwards and held in a tiny topknot on the top of his head. He is dressed in a pair of white undershorts with pink hearts all over them and a grey Tshirt with a slogan about being green on it. This is hardly the surroundings for a Mitch, a hair salon, or a “green” T shirt. I ask him why he has come here, but he just shrugs and smiles again. There are so many questions I want to ask him, but I realise that he doesn’t want to talk about himself. When I am not asking personal questions he proves to be delightful and funny. He can’t believe I am walking along these gang planks alone and warns me to be very careful of the people who live here. I tell him that if I hadn’t come into this village I wouldn’t have met him. I tell him that I can’t come back later and without a photo, how will I remember him. Then I ask if I can take a close up. “Aaaah, an EnglishMAN” drawing out the word English and putting heavy emphasis on the word “man”. ”Mmmmmmmmmm” he continues “I don’t think I have ever MET an Englishman” Heavy emphasis on the word met, with one raised eyebrow. When I leave he shakes my hand and it takes some time for me to persuade him to let it go. He is truly fabulous and he and people like him, are the reason I travel. The memory of him is going to haunt me. How can someone like that survive in those wretched slums and how can he be so cheerful. And you didn’t even get a shave and a haircut? More to the point, who are Mitch’s clientele? This is probably the best blog post I have ever read, ever, on any subject. It was very, very moving; Mitch makes me both fabulously happy and terribly sad. I’m so glad you were able to take pictures of him and of his inspiring salon. I’ll never forget him… and I’ll always wonder how many people like him there are, making the best of an incredibly difficult situation, in places like that all over the world. Brinlee, thanks so much for your comment. I will never forget Mitch either. Sadly I am quite sure there are many many more like him around the world. Love the fabulosity meter and thrilled it could find fabulous even there. So glad you enjoyed it! We try to find fabulosity where ever we go – but it isn’t always easy!